He was the best Santa I'd ever seen and such a nice man. We were standing right there. The event was at a private little shop near my parents house, very low-key and no crowds. You'd think it would be the perfect setting for a first introduction. Notsomuch. 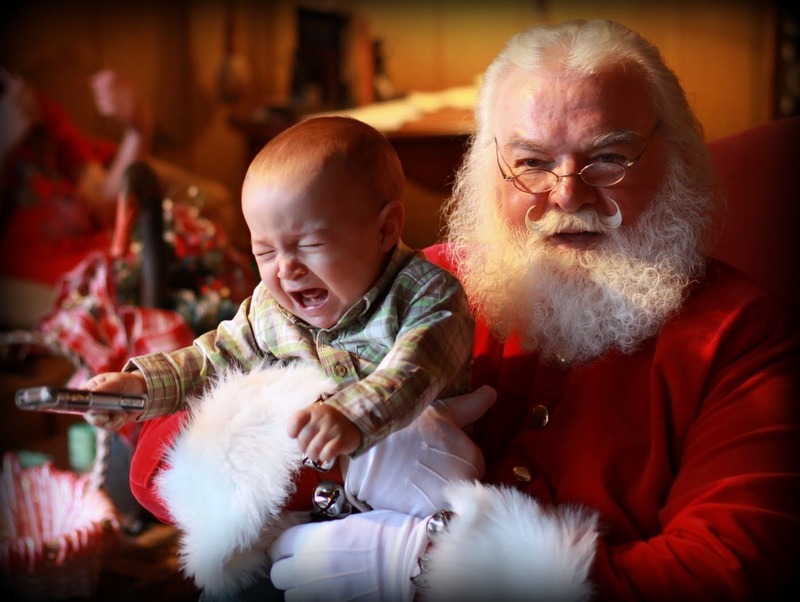 Poor little boy was just not impressed with the jolly man in the red suit. G is normally very easy going and will allow himself to be held by anyone, once he gets the nod that his Daddy or I approve. So, what is it about Santa Claus? PS - My friend Sara commented about the cell phone in his hand. No, even the shake the dice game on his Daddy's cell phone, which normally brings on fits of giggles, would not quell the Santa terror. I assure everyone that G was not actually traumatized and that he sat calmly for a photo with a mall Santa another day. OMG, classic shot Jen! It took A 30 seconds to get upset like G last year... I have a feeling this year Santa will be scary too! I remember a pic of me older like 3 or 4 screaming in the santa pic! lol. Poor kid.